His Highness Sheikh Mohammed bin Rashid Al Maktoum, Vice President and Prime Minister of the United Arab Emirates and Ruler of Dubai, opened the Burj Al Arab Terrace in the presence of Deputy Ruler of Dubai Sheikh Maktoum bin Mohammed bin Rashid Al Maktoum. The architectural form of the Terrace has been designed to reflect the shape of Burj Al Arab, creating a fusion of sophisticated, contemporary structures and tranquil stretches of water. Linked by a central walkway, flanked on either side by crystalline beaches and private cabanas, it gives the effect of a stylised tropical forest canopy, with contrasting areas of dappled light and shade. Chairman of Mohammed bin Rashid Al Maktoum Foundation Sheikh Ahmed bin Mohammed bin Rashid Al Maktoum; Sheikh Mansoor bin Mohammed bin Rashid Al Maktoum; Chairman of Dubai Holding Mohammad Al Gergawi; and Director General of Dubai Protocol Department Khalifa Saeed Sulaiman and a host of senior officials and tourism industry leaders attended the opening event. His Highness Sheikh Mohammed bin Rashid toured the outdoor luxury leisure facility and was briefed on the construction phases, design, building technologies and the methods used to transport the ‘artificial island’ from Finland to Dubai. Sheikh Mohammed praised the concept of the project, which he said, represents the highest innovation and creativity in design and implementation. His Highness said that innovation and excellence are a hallmark of projects implemented in the UAE and Dubai is keen to encourage such creativity to achieve progress in all fields. 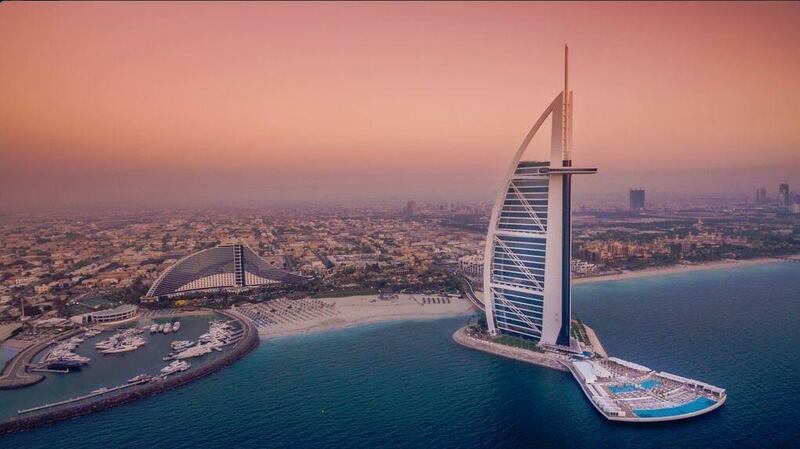 His Highness further said: “A few days ago, we inaugurated the world’s first 3D printed office, and today we are opening Burj Al Arab Terrace, the first manmade luxury beach facility of its kind. Both projects reflect Dubai’s vision to achieve global leadership in innovation and excellence. The 5,000 ton artificial island was constructed at a shipyard site in Finland and then transported by ship to Dubai in eight pieces, ensuring minimal disruption to guests, as well as the seabed and marine life. Now in place, the 10,000m2 outdoor luxury leisure facility seamlessly stretches 100m out into the sea and is home to Scape Restaurant, two stunning pools, dedicated butler-serviced cabanas, and a beach area with luxury day and sunbeds. As such, Burj Al Arab Terrace not only pushes the boundaries of construction, but also of design, architecture and hospitality. Vice Chairman and Managing Director of Dubai Holding Ahmad Bin Byat expressed his gratitude to His Highness Sheikh Mohammed bin Rashid Al Maktoum for supporting innovation in all forms across sectors, including tourism and hospitality, an important pillar of the local economy. Bin Byat said that Sheikh Mohammed’s support for innovation and creativity encourages people to present new projects and ideas that can contribute to the country’s economic development. The Managing Director of Dubai Holding also said that the new project further raises Dubai’s profile as a global hub for tourism and upscale hospitality.